A blank piece of paper, delicate and fragile. Decisive black ink mark on it, which is a record of the artist’s gesture. Although she was saying, that she was lacking in her drawing technique, looking at her works this sounds more like a feminine coquetry, waiting for the confirmation of something contrary. 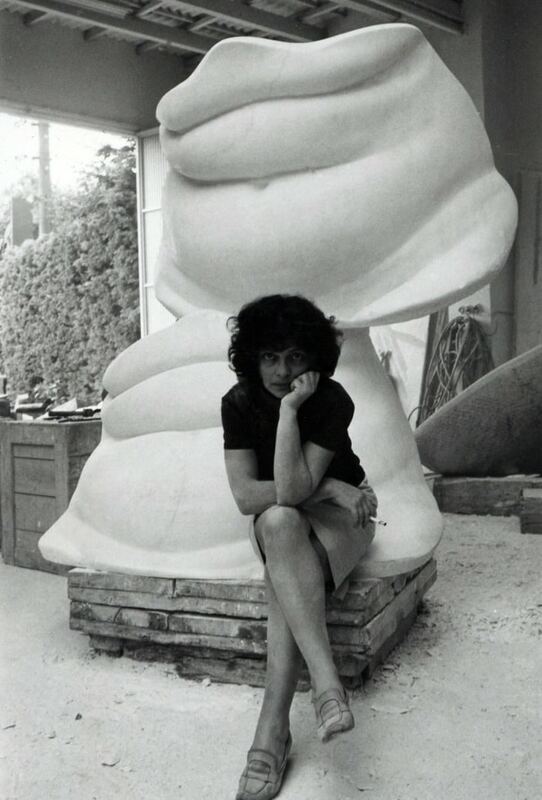 Alina Szapocznikow was a sculptor. She used the technique dominated by males, requiring strength, certainty, determination and courage – because there is no turning back when working in stone. She was conscious of her artistic choices and she consistently stuck to them. The drawing was very important for her, both as a starting point to reflection on the sculpture, but also as an independent medium to express a contents and a form. As for majority of sculptors, the drawing was very important element in her reflections about the form, which was then realized by her in three-dimensions. Therefore we can connect very often her works on paper and sketches with the specific works. For example sometimes the whole surface of paper was filled in with undulated, crumpled forms standing on short legs (1959-1960) corresponding to the form of such sculptures as Corrida I and The Monument of the Moving Star from 1961. Some other time the slender and elegant forms standing on one thin leg appear (1960) as in the sculptures Wdzięcząca (Flirting) 1961, Wiecha (Wisp) 1963 or Study from 1963. All these drawings and sketches on the paper have very strong link with sculptures and their interrelationship can be seen with naked eye. It was very characteristic of Szapocznikow’s works, that both technics of her artistic expression were combined by specific feature – namely a strong relation with the human body. Nearly all her works take on strictly organic shape. Although they seem to be abstract at first glance, the human body – the female body is the starting point for them. The moment of transition from figuration to abstraction is most visible in two sketches to the Auschwitz Monument from 1958. Two hands directed upwards with splayed fingers slowly become deformed and assume more smooth, indefinable shape. The next drawings show the deformation process even more deep. The human figure is blurring, its shape is swelling and simplifying. Sometimes the hands assume a form of spread quasi-wings, and the legs are reduced to some symbolic, thin abutment of the oval “trunk” (the sketches to Bellissima 1959, Duo and Jester from the years 1959-1960 and the sculptures: Nike, Flower, Mermaid VI from 1959 – 1960). Sometimes the deformed body became similar to the plant. The relationship between the female’s body and the flower was a constant motive appearing in Szapocznikow’s works. 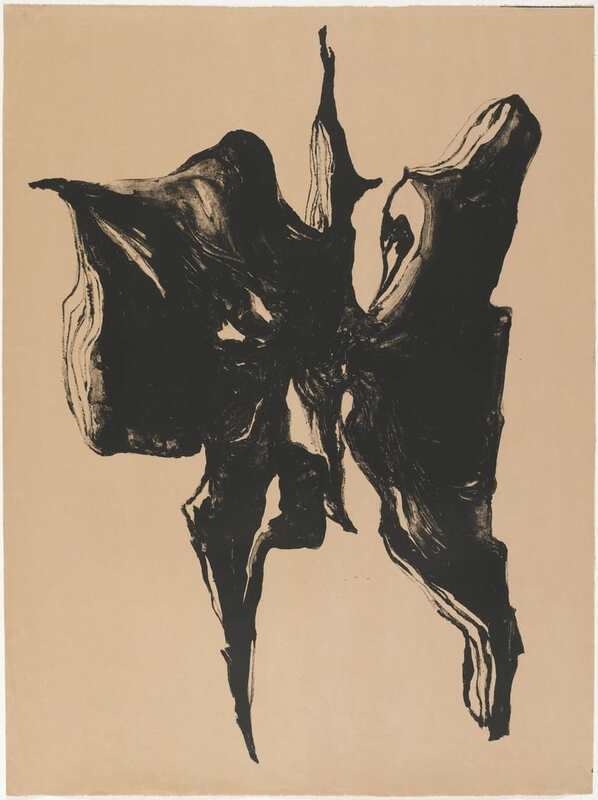 In the drawing from 1959 Studies of a Flower and a Figure these two forms are still separated, but in subsequent, even from the same year, they combine and merge each other slowly and melt into one. The culmination of this process is shown in a sketch to the sculpture Woman-Rose from about 1959. Szapocznikow’s works are very feminine and sensual independently of used technique. This tendency intensified in the drawings from the 60s., when the oval forms resembling a head, a neck and a chest started to appear. Sometimes those forms give us a suggestion of the lips, breasts and vaginas. Also in the sculptures from that period the imprints of the faces, lips and breasts or bellies begin to appear more and more often. Two trends are visible on a paper. On the one hand there are painted monotypes and the drawings with sharp and strong shapes painted with marker or ink filling up the paper surface. But on the other hand a line starts to be very gentle, wavy and outlining the form very sensuously. Next to the softness and sensuality the element of fragility and impermanence begins to encroach. The body withers as a flower and is exposed and depends on external factors. It brings the announcement of the impermanence of the human matter. The drawings from the late 60s. and early 70. often return to a realistic form of the human body. The deformation is connected with real mutations of human organism. The growths appearing in the drawings are the reflections of “the tumors” in her sculpture forms. The first growths are already visible in the works from 1968. The other studies of the people with growths made with brown marker or pastels on a paper show the body often without a head, covered by the oval shapes concentrated in the area of head, breast, belly and legs (Sketch of Growths on a Leg 1 – 4, Sketch of the “Journey” with Growths 1 – 2 from 1970, Bust-Length Figure of a Woman, Headless 2 from 1971). The series of Fetishes, which lost its aesthetic dimension, also come from those years. They referred to the forms of tumours/ growths which appeared earlier in her art. However they had some additional value. They absorbed the artist’s environment and the elements creating her reality (just like in the series of Desserts). The casts captured the parts of her body. Her polyester emballages ensnared her jackets, shirts and leather shoes. They grabbed the stockings, the underwear and the body casts of their owner (lips, breasts, buttocks, or feet). The apron smeared with plaster on her coat or a daily newspaper have been detained at the time, trapped in the solid of the object. Fetishes dont’t have to delude our senses with beauty, and colours. They are just this what creates them. In these years her illness started to get worse. This changed her way of thinking. Her attitude to life became more and more fetishizing. She attempted to stop everything which was associated with life and which was confirming her existence. The drawings are the intimate and fragile diary of this. Not quite understandable for a third person, they are shrouded in mystery and ambiguity. Sometimes the curtain slightly uncovers the personal experiences and thoughts of the artist in those drawings. They constitute the next steps and the next attempts to capture the “idea” which absorbed the life and work of Alina Szapocznikow – they are the traces which are fully understandable only to her. The exhibition “Du dessin à la sculpture” at the Centre Pompidou is another foreign show of Alina Szapocznikow’s works. 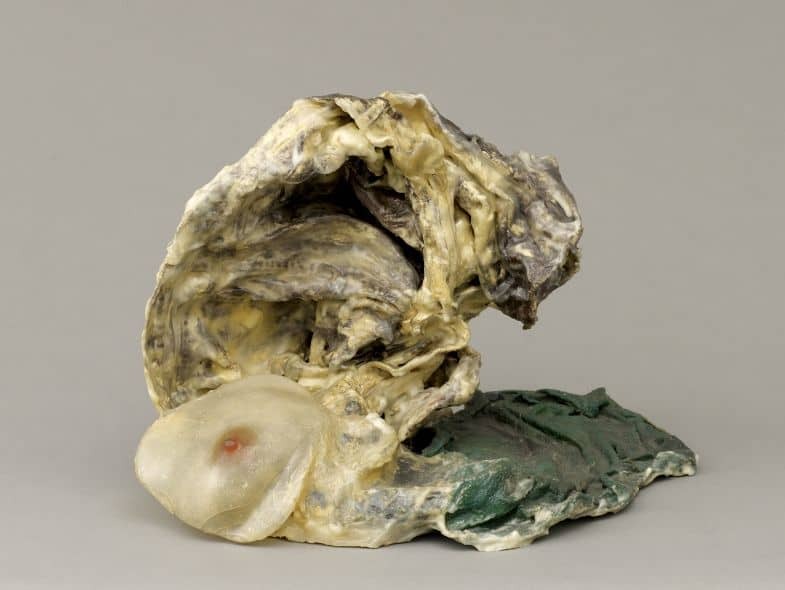 The first presentation of her works from the exhibitions cycle titled: “Alina Szapocznikow: Sculpture Undone, 1955-1972” was organized in the Wiels Contemporay Art Centre in Brussels in Autumn 2001. This very important event organized by the Wiels Contemporary Art Center and the Museum of Modern Art in Warsaw, traveled then across the United States. Another retrospective exhibition took place at the Hammer Museum in Los Angeles and Wexner Center for the Arts, Columbus, Ohio. The culmination point was the exhibition at New York’s Museum of Modern Art. During four months the Museum was presenting her works from the years 1955 – 1972, however, the main accent has been placed on the ten-year period between 1960 and 1970. During the exposition in the Centre Pompidou the accent falls on works on paper by Alina Szapocznikow. There are nearly 100 drawings and sketches and numerous sculptures presented in this exposition. According to the museum information, the exhibition will show also the recent acquisitions of the Centre Pompidou. 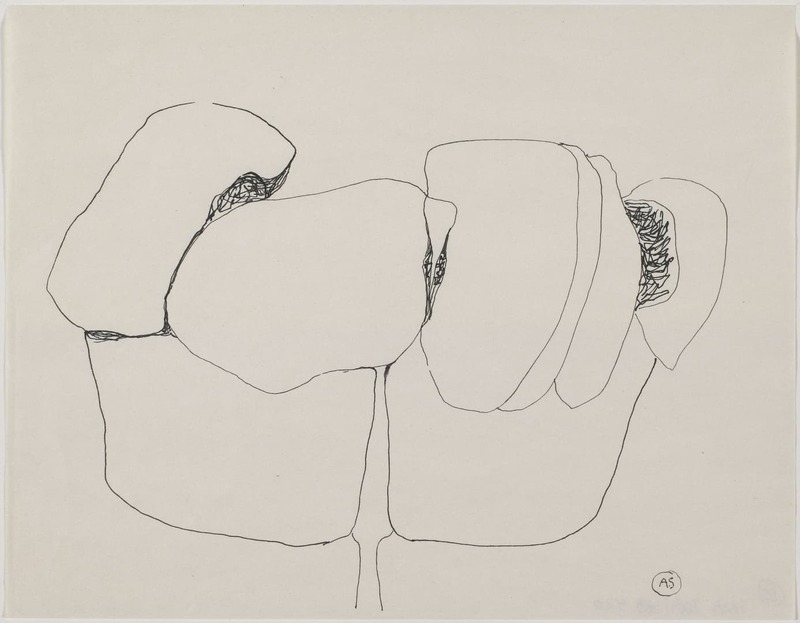 In 2012 the collection of Szapocznikow’s works expanded by 5 drawings and one sculpture – the Fetish II also called as Sein en chiffon vert (Breast in a green Towel) from the years 1970 to 1971. 1 K. Czerni, The Second Wing or Alina Szapocznikow’s Dream about Flying [w:] :] Alina Szapocznikow. Capturing Life: drawings and sculptures, Kraków, Warszawa 2004, p. 16. 2 K. Czerni, The Second Wing or Alina Szapocznikow’s Dream about Flying [w:] :] Alina Szapocznikow. Capturing Life: drawings and sculptures, Kraków, Warszawa 2004, p. 15.